August 6, 2009, 1:11 p.m. The Redwood household achieved this conservation feat mostly by storing the free rainwater that falls on their roof and making the garden drought-tolerant. And if you live in Los Angeles, you’ve got serious incentives to do the same. First, there’s the tougher water regulations that went into effect earlier this year. Then there’s the offer for free rain barrels and installation from the city to encourage residents and business owners to make use of free water that falls on their roof. 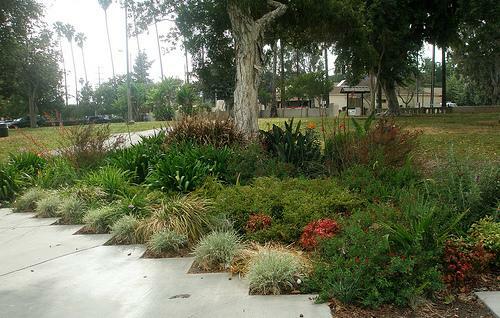 Now, the city’s offering FREE California Friendly Landscape Workshops (PDF) for LADWP customers. “Learn effective ways to care for your lawn and conserve water through low maintenance, affordable landscaping practices,” announces the LADWP’s press release. All workshops run from 8 a.m. to noon. To RSVP, fill out a contact form for the LADWP or call (800)544-4498 and press 5.